Blogs from the bank: Carp and Coarse fishing: Charlie's Transformation! The new swims at Charlie's Lake are lovely. However, you will need a mallet for your bivvy pegs! It has been about a year since I visited Charlie's Lake, Ashford for the first time. My experience on that occasion was quite mixed - the quality of fishing was great but the strict rules did not seem to have been enforced and the facilities were not exactly comfortable. How it has changed since then! New owners Karen and Steve, who are both very friendly, have done a remarkable job of tidying the lake up, building new swims, the toilet flushes now, rig checks are carried out and bookings are strictly enforced. My latest visit last weekend was a real pleasure, marred only a little by the cold north easterly wind. A warm spell a week prior to my session had served to raise water temperatures and switch the cats on to feeding and whilst by my arrival the frenzy had slowed a little, a steady stream of runs were enjoyed by my friends and I throughout our stay. Angling buddies Richard and Shaun getting some action! 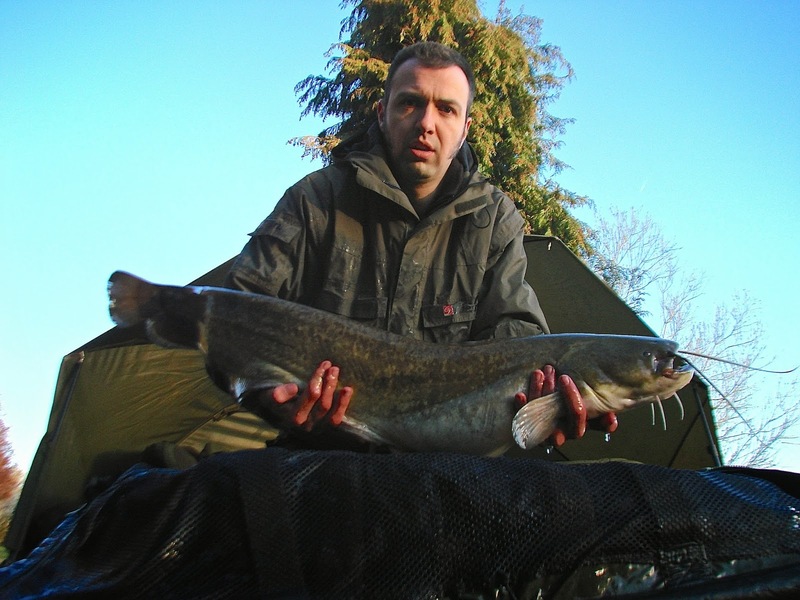 If you are targeting cats at Charlie's you must have 18b mainline, use running rigs and barbless hooks. Last time I fished here I used ultra light ledgers in the belief that cats don't like to feel any resistance. I have since heard that it's a change in resistance they don't like and so used heavier leads which will stay put and allow line to run through the big plastic eye of my korum run-rig lead-clip. I experimented with slack and tight lines and to be totally honest neither seemed to have any advantage or disadvantage when it came to hook-ups under these conditions. One tactic that did pay off, I believe was glugging all my hook baits heavily in Predator Liquid. Everyone knows that cats can sense food from some distance through their whiskers but when you see how small their eyes are you realise that they are clearly not sight-predators in the same way pike are for example and therefore any additional scent I can put in the water to help them find my bait has got to be an advantage. For hook baits I used 30mm Bloodied Eel pellets, double 20mm Halibut pellets, ID Bait's Krustacean boilies and large chunks of luncheon meat. The cats took all of these indiscriminately. I had several double figure fish and beat my old Wels Catfish PB of 17lbs 3 times in this session resulting in a new PB of 22lb. Although bigger fish are regularly caught here I am very pleased with this fish as I don't go after cats often at all. Now that the new owners have transformed Charlie's Lake I am much more inclined to return to try for something even bigger! Fishing at Charlie's is strictly for over 18s and costs £15 per 12hrs. Look here for rules and further details. I'd recommend booking at busy times by calling Karen on 07857539785.